If you are highly allergic to nuts, wheat, soy, and/or gluten, Lagusta’s Luscious chocolates are not for you. All of our chocolate contains soy lecithin, approximately .03% of the total ingredients. We use nuts in many chocolates. We use gluten in a small number of chocolates. Though we take care to reduce cross-contamination, we cannot guarantee that any of our chocolates are free from small particles of any allergen because we work in a very small space. Ingredients are always listed on the website descriptions and products. Lagusta’s Luscious is an all vegan facility, but because our bulk chocolate manufacturer also manufactures milk chocolate, there is a very very small chance of dairy cross-contamination. Our chocolate manufacturer guarantees any cross contamination would be parts per million and they have an extremely rigorous cleaning and testing procedure to avoid cross-contamination. We make everything by hand and ship within 1-4 business days. We work super hard to make sure all packages go out ASAP—usually within two days! Lead times are often longer during holiday periods, so please place your order early to ensure we’re able to produce and fulfill your order. Please note in the comments to your order if you’d like us to ship your order to arrive on a particular day. Please note that only overnight shipping methods (UPS Overnight, USPS Express) are guaranteed to arrive overnight. Shipping via Priority Mail or other methods will not guarantee your package arrives on a certain day. – Guaranteed UPS option (Next Day Air, 2nd Day Air, 3 Day Select).If you select a faster guaranteed shipping option please be aware that normal lead times for production still apply to make your treats! 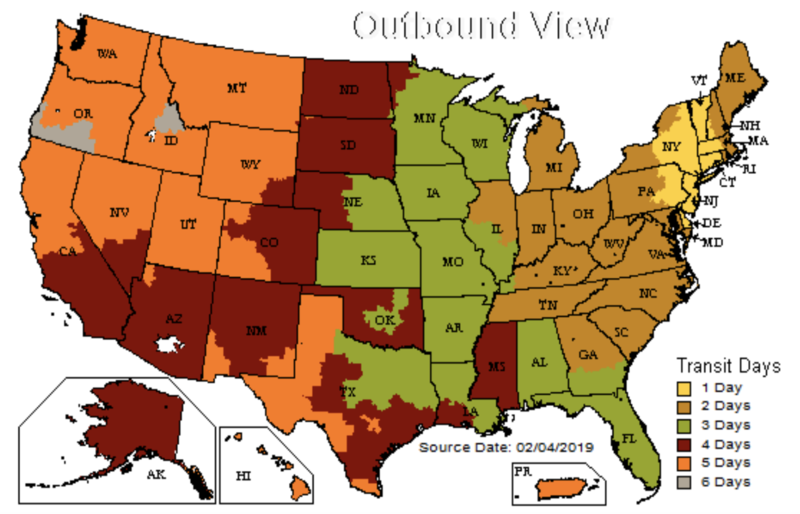 Please be aware that if shipping to an NY area address your best guaranteed option may be UPS Ground as they’ll guarantee next day delivery within a certain area. Refer to the map at the bottom of this page for exact guarantee shipping times. We ship to all of the United States. Regrettably, we can not ship elsewhere (including Canada, so sorry!) at this time. Please be aware that chocolate is a perishable material and is susceptible to all manners of weather (heat, humidity, freezing, etc.). We package our chocolates with the utmost care and offer thermal options for hot conditions (cold packs and cold wrap) but can not control what the carrier does with your package! Kindly ensure the shipping address is correct, the package can be accepted upon first attempt so it’s not returned to the carrier, and that the package is not exposed to the elements when delivered. We cannot offer refunds or returns for your chocolate if damaged due to shipping issues. If you’ve selected “Shop Pick Up” as your shipping option, we will email you when your order is ready for pickup. We include a Cold Pack with your order from May-October. $2.95 is automatically added to each order for the Cold Pack. If you are shipping your chocolates to a destination over 65°F at any time of year, we recommend adding a Cold Pack to your order ($2.95) as well as selecting a overnight shipping option. We can’t guarantee that your chocolate will arrive unmelted, particularly in very warm climates or if the package sits on a hot doorstep all day, but it will cut the risk of melting. Our ice packs are reusable: just refreeze them! We are unable to split an order and ship to multiple addresses. If you wish to ship to multiple addresses you’ll have to place multiple orders. You can have numerous “ship-to” addresses in your address book for just this purpose. Please do not place an order and ask to split a shipment in the comments section as this will delay your order and may result in the cancelation of the entire order. Regrettably, if you do not provide a correct address and thus your chocolates do not get to you and returned, we cannot resend the same chocolates back to you because they will have suffered a significant decrease in quality. Be sure the address you enter during checkout is correct! We use bio-degradable cornstarch peanuts for packing material. However, some packages may contain other packing material such as paper, candy pads, plastic bubbles or bubblewrap, etc. We re-use clean packing material as much as possible and receive material from local businesses to re-use. We try to re-use first and then use new packing materials so rest assured that we have not, and would not, purchase plastic packing materials! Please feel free to contact us via email or telephone for any shipping questions. 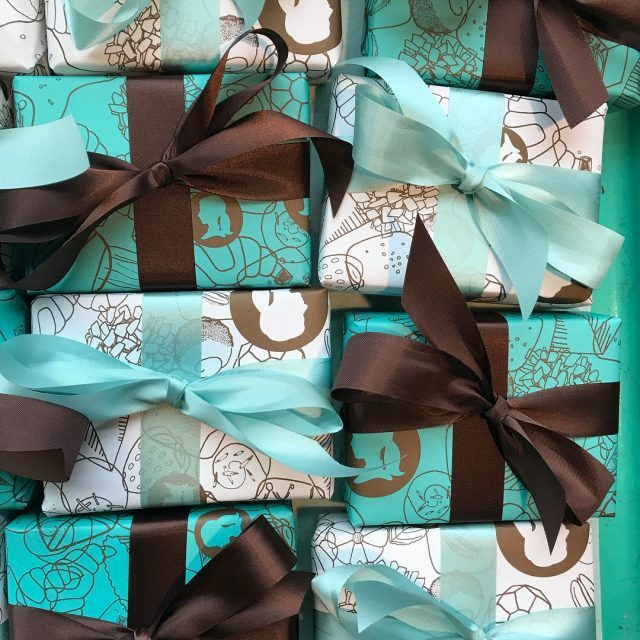 If you select the gift wrapping option when checking out, we will wrap your treats with 100% post-consumer recycled paper and biodegradable (compostable!) ribbon. Please note on your order if you’d like your items wrapped separately, otherwise we will wrap them together. For best flavor and texture, bring chocolates to room temperature before eating. Like most foods, confections are better when fresh. We recommend eating all filled chocolates within one week. Caramels should be eaten within two months, and solid chocolates will last up to three months. Store all chocolates at cool room temperature or in a sealed container in the refrigerator. Never freeze chocolate, which will dull its flavors.